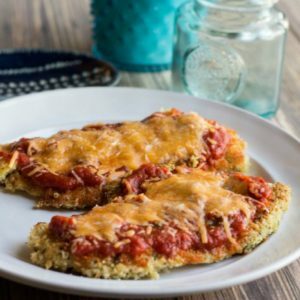 This recipe is 6 SmartPoints per serving, one chicken breast topped with marinara sauce and cheese. In a small bowl, combine the egg whites and some salt and pepper. Mix together. On a small plate, combine the Panko breadcrumbs, 1 oz Parmesan cheese and some salt and pepper. Heat a nonstick skillet to medium-low heat. Place each chicken breast in the egg mixture, making sure to cover both sides of the chicken. Immediately place each chicken breast in the panko mixture and cover both sides with the breadcrumbs. Shake off the excess. Place the Panko covered chicken breast in the heated skillet and cook on both sides until chicken is cooked through, about 8 minutes. Once all the chicken is cooked, spoon a small amount of marinara sauce onto each chicken breast. Add the rest of the cheese and place in the oven for about 15 minutes. Serve immediately.